I would like to keep here all the Enroth's stories, and hope to make a chronological history timeline. It could helps anyone to add stories in the already existant background or Enroth (for mapmakers, fan arts, story tellers, etc...) without breaking the "real" story of Enroth. Lord Morglin Ironfist, who is forced to flee his homeland through a magical portal, because his cousin, Ragnar, had usurped the throne after his uncle, Ragnar's father, killed Ironfist's father, the legitimate owner of the throne. He finds himself along with his few followers in a strange and uncharted land, called Enroth. The land is unruled but contested by Ironfist and three other warlords: the barbarian Lord Slayer, the sorceress Queen Lamanda, and the warlock Lord Alamar. Lord Ironfist defeats his three opponents and founds a new kingdom in Enroth. Lord Morglin Ironfist has successfully unified the continent of Enroth and secured his rule as king. Upon the king's death, his two sons, Archibald and Roland, vie for the crown. Archibald orchestrates a series of events that lead to Roland's exile. Archibald is then declared the new king, while Roland organizes a resistance. On the Roland's victory, Archibald is turned to stone by Roland's court wizard, Tanir. Roland Ironfist spouse Catherine Gryphonheart. Please post here anything you know and or is missing about the story. Are you familiar with the storyline of Might&Magic series? If yes, there is no trouble, because Enrothian history is actually incorporated into it. There, all known dates of modern Enroth have a suffix of After Silence (AS), with that being a major event in Might&Magic story. 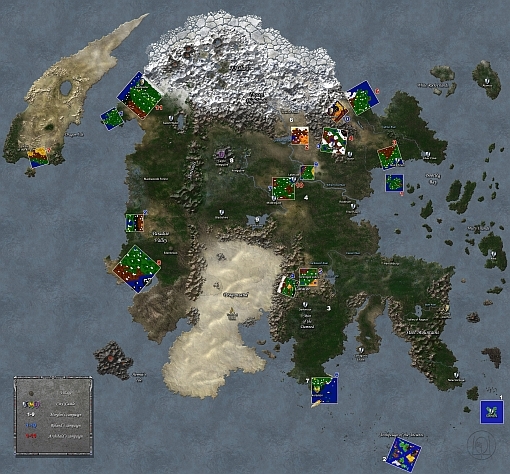 There is also a fan-made map which was designed to fit the possible locations of Heroes 1 and Heroes 2 campaign scenarios, being also more or less fitting to the official map of Enroth as it is shown in Might&Magic VI: The Mandate of Heaven. Thank you for these 2 very useful links. So, because this timeline exist on the "M&M fandom wiki", it'll make it more simple. The goal of this topic is to permit anyone to get "basic knowledge of Enroth's History". Because, I clearly need lessons about the History and so, I'm learning it while making this topic. Actually I lake informations about Price of Loyalty and probably later on on H3SW's history. The Price of Loyalty does not have any history. There is a community in Russian internet section which tried to adapt PoL timeline to the original timeline, but this is a fan-made assumption and is in no way canonical, regardless of the fact that these people try to brainwash their auditory with their ideas. The reason for that is simple. In the end of 1990s, sometimes the expansions were given to outsource companies for development. This also was done, for example, with Half-Life: Blue Shift and Half-Life: Opposing Force. In these times, the expansion developers tried to create a storyline which would not possibly harm the plans/designs of the developers of original games. So that PoL is not happening in Enroth, and all campaign characters there do not appear in Enroth. It is only the publisher/copyright holder who decides if the outsource storyline is canon or not, and sometimes changes decisions. In the case of Half-Life, the Blue Shift expansion was made canon, and the Opposing Force expansion was not, even although once planned to. In the case of PoL, there was not any official continuation of the story. Even the Solmyr character was present on a fan-made map (and not in an official campaign), which might have probably influenced on the creation of Heroes 3/Heroes 4 Solmyr. However, many gameplay ideas introduced in PoL was definitely taken by New World Computing during the development of Heroes 3. Do you intend to add hero biographies in the H3SW, or rather consider them unimportant? Thank you Orzie for this precise talking. Thank you Hiro for this map. However it reminds me that i stored a "not cuted" version of this map somewhere... But the colors are more "flat". You should note that the map I sent is a fan-made one. The map from MM6 is canon, but it has no relations with Heroes 2 whatsoever. Basically, it is retconned.